It is located on the tympanum above the imperial door leading to the narthex. This door was used only by emperors, and it was the most splendid entry to the church. 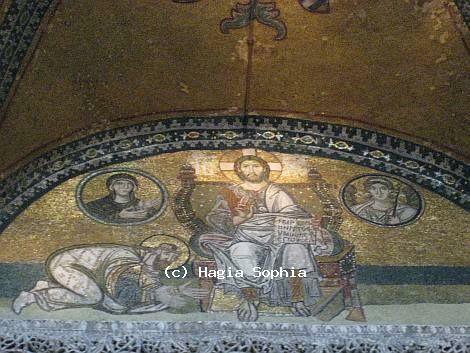 The mosaics date back to 9 or 10th century. Emperor Leo VI with a halo over his head is giving proskynesis, an act of respect – to Christ, who is sitting on a jeweled throne. With his right hand, Christ is blessing the emperor, and his left hand is holding a book written “Peace be with you. I am the light of the world” on it. On both sides of Christ, there are figures in the roundels. One of them is His Mother Mary and the other is Archangel Gabriel. This image is intended to show the timeless power of emperor and his subjects blessed by Christ.